On a balcony deep in the Taichung countryside, two brothers watch in anticipation as their friend pours the first glass of their first ever homebrew. It tastes good but will it be good enough to sell? Fast forward through four years of trials and tribulations, and they have finally found their answer. For brothers Casper and Adriaan, and their good friend and business partner Kevin, it’s been a long and arduous road to bring their dream to fruition. But after the successful Grand Opening of their brand and brewpub in early August, it would seem that the Three Giants are on the cusp of greatness. It all started with a trip to Canada. The South African born twins, Casper and Adriaan (the beer lovers that they are) sampled locally brewed craft beers and spent some time talking with several brewers. When they got home, they decided that by hook or by crook they’d brew a beer that would put the commercial beers they usually drank to shame. Irishman and beer lover Kevin heard of their plans and jumped on board, and the Three Giants (the moniker would come later) started brewing in small 20-liter boil pots. Armed with as much information as they could find on brewing, all three jumped in with both feet, spending every minute of their free time perfecting their brews. Using their friends and family as guinea pigs, the boys quickly realized that not only were they getting good but that there was a huge demand for anything that wasn’t the tasteless, gassy beers available in every convenience store refrigerator. They initially moved up to 50-liter brew pots, but it soon became clear that if they were going to do this properly, they’d need a custom made brewing system. Kevin’s engineering background alongside Casper’s biochemistry experience became invaluable at this point as they moved onto a 100-liter brewing system. However, the waiting list of friends and family members that wanted to volunteer as taste testers led the three to consider once again how far they wanted to go with this. After some number crunching the three friends came up with a viable business plan for a brewery that could supply local restaurants and bars. And so, the long search began for a suitable property where they could build a brewing system capable of meeting this demand. Interestingly though, this was perhaps their largest hurdle and one that almost led to the three throwing the towel in before they had even begun. 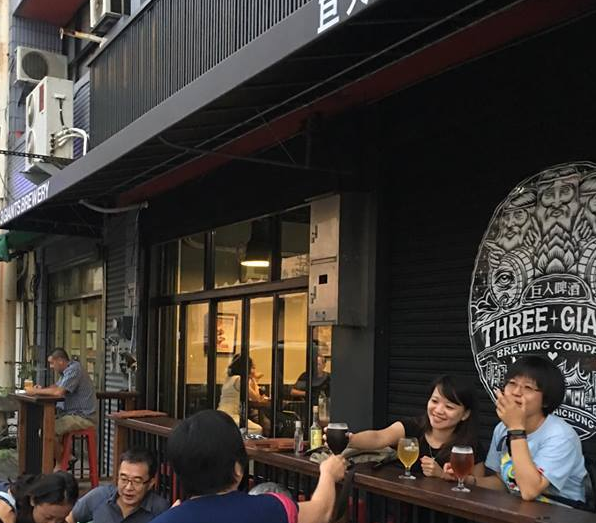 ‘This place’ is the newly opened brewery and brewpub in Fengyuan. And while it now looks the part with its solid wood bar, taps serving fresh beer, and a large window to watch the boys at work, it took a lot of effort behind the scenes to get it this far. Asking Casper about the bar, I wondered if they had envisioned it as it stands now. The brewpub is an impressive sight. And all the more so given that all three partners built everything themselves while still holding down full-time jobs. But while the décor and surroundings are of course important, it’s all for nothing if the brewery doesn’t come up with the goods. And if the crowd enjoying the beers at the grand opening is anything to go by, then they’ve certainly hit the right note with their brews. I asked the three friends about their three signature beers (they seem to like the number three) as I sampled each. The three also told me of their plans for future additions to their family of beers; 3 Giants Red-X IPA, distinctive due to its passion fruit aroma, and their take on the classic German Hefeweizen beer. 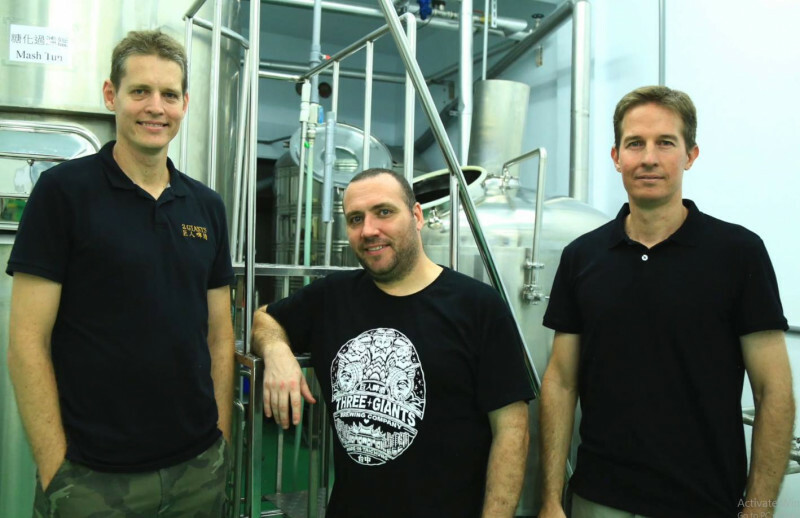 And with Casper currently studying for his Degree in Brewing and Distillation from world-renowned Heriot Watt University in Scotland, it looks like the Three Giants are in it for the long haul. 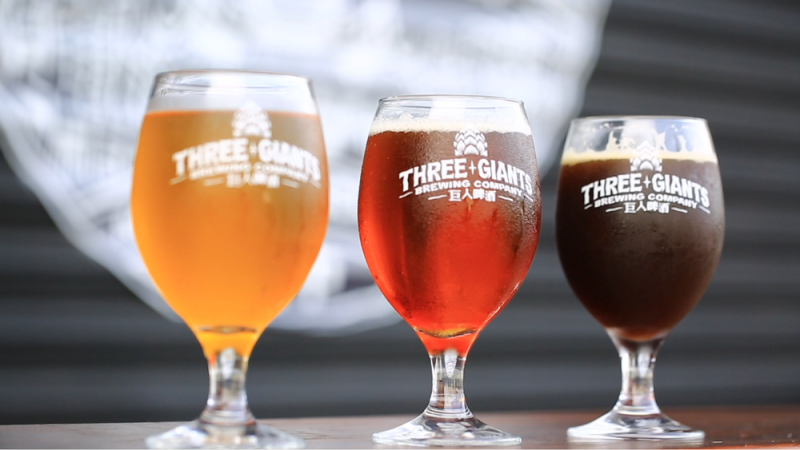 You can also check out their Facebook page for the latest updates and news of any planned events @ 3 Giants Brewing Co. 巨人啤酒釀造. Alternatively, you can buy Three Giants beers at any of the locations listed below.